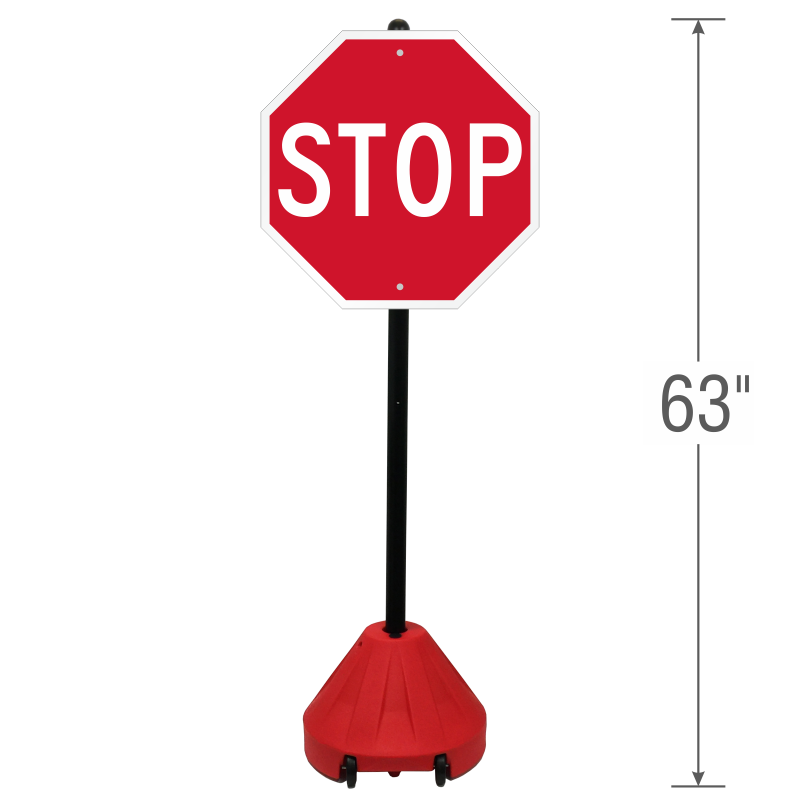 Great for intersections, residential areas and near locations where children play or frequent, our Roll 'n' Pole Stop Sign and Post Kit notify drivers and cyclist to come to a complete stop before proceeding. The MUTCD compliant "Stop" sign is the same recognizable traffic device used by various cities and municipalities across the country. • The built-in wheels and EZ-grip finial knob allows you to effortlessly store or relocate the unit to maximize its visibility. • Zero to no maintenance, the Roll 'n' Pole will never rust, discolor or need repainting. • Built-in ballast has 2.5 gallon capacity that allows you to regulate the weight of the base by filling it with different substances (i.e. water, sand, gravel or concrete) to suit your specific application. 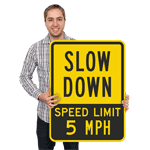 • Includes a 'STOP' sign made of 80 mil thick aluminum with a reflective engineer grade overlaminate that enhances nighttime visibility. • The security bolt on the neck of the base impedes removal or tampering of pole from unit and increases the stability of the sign. • Base, post, sign and hardware are all included, saving you time and money from purchasing each accessory individually. • Built for stability, the aerodynamic design of the base can withstand winds of up to 40 mph. 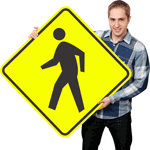 • Compatible with any sign ranging from 9" x 12" to 24" x 24" (excluding diamond shaped signs). 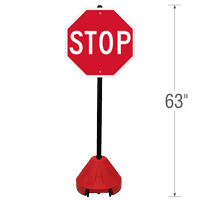 • Rolling Portable Pole Sign Holders are made from rustproof plastic technopolymers to withstand harsh environments. Whether its snow, rain, sleet, or the baking heat of summer this durable material won't fracture, break or degrade. • The heavy-duty base and split flanged bushing provides support to the sign post - helping to maintain stability when subjected to wind loads of up to 40 mph. • Pre-drilled poles are made of High-Density Polyethyene (HDPE) which is thicker than PVC and won't get brittle in low temperatures - delivering higher impact resistance. • For additional weight and stability in windy conditions, the base of the sign holder has two built-in ballast ports that are able to accept water, sand, or gravel. The ballast port has a capacity of 2.5 gallons, adding an extra 19-21 lbs of weight. • Includes four new and improved soft edge 'Stability Plates' with rounded corners allowing your sign to sit flush against the pole to prevent twisting and bending in the wind. 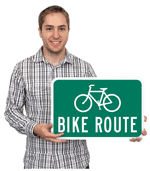 Sign holders are compatible with 9" x 12" to 24" x 24" and 12" x 36" sized signs. • Alcoved wheels are suspended above the ground and can be deployed by simply tipping the base using the ‘EZ-GRIP’ finial knob located on top of the pole – providing easy transport or maneuverability. • The base is available in 4 colors: standard black, danger red, handicapped blue and safety yellow. The post is available in 2 sizes: a standard 46" in length and a deluxe 58" in length. 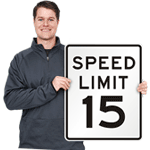 • Aluminum signs are 80 mil thick and resist weathering, corroding, and rusting. The material is pre-drilled with mounting holes for easy installation. 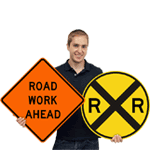 Signs come with a 3M reflective film that refracts any light directed towards it, such as flashlights or headlights.